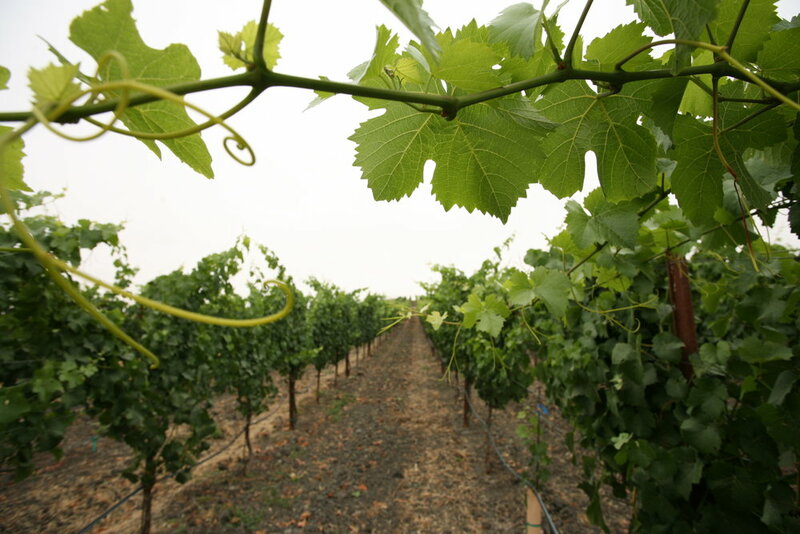 Terra de Promissio, the Land of Promise, is one of California's most recognized vineyards. We are very humbled with the accolades the vineyard has received over the years and very honored that Terra de Promissio is now the most vineyard designated pinot noir vineyard in Sonoma County. For the 2016 vintage, 10 different wineries have a wine named Terra de Promissio. Since day one, every row and block is custom farmed per each of the winemakers specific instructions. Each winemaker makes multiple visits to the vineyard to their designated rows as we prune, sucker, train and manage the canopy, remove green fruit and finally harvest. We treat each vine individually ensuring that it has the ability to consistently produce fruit possessing a balance of sugars, acidity, and physiological ripeness. During the summer, to achieve the results that we and the winemakers desire, we also drop fruit. Even though the Dijion clones we grow produce smaller berries and clusters, we go thru the vineyard and cut green fruit to keep yields low to achieve fruit intensity. The results of a “lighten crop load” allows the vineyard to produce superior Pinot Noir. This collaborative effort ensures the best possible fruit for the wineries and the results speak for themselves. Most importantly, we have learned a lot from all of our winemakers and we have used this knowledge to help make our own Land of Promise wine. "As a family run and operated vineyard, as well as our home, we are strong believers in being God’s stewards of this land and custodians of its future. We employ hands-on sustainable farming practices that not only produce the finest Pinot Noir grapes, but also ensure the livelihood of the environment for us, our son and daughter, and the generations that will follow them. Terra de Promissio does not belong to us, we belong to it…"
At Terra de Promissio, we always harvest at night. The picks usually begin at midnight and go all night to dawn. 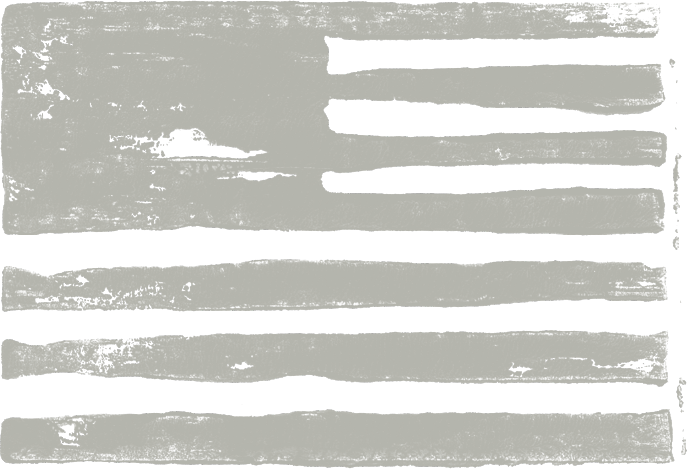 For Land of Promise, we custom farm to our specifications. Every cluster for Land of Promise goes thru a family members hands. Diana (pictured below), her sister Alina and Diana's Mom are all on the back of the tractors--on the bins--every night of the pick. If a cluster does not meet our family's standards, it is removed immediately from the bins. 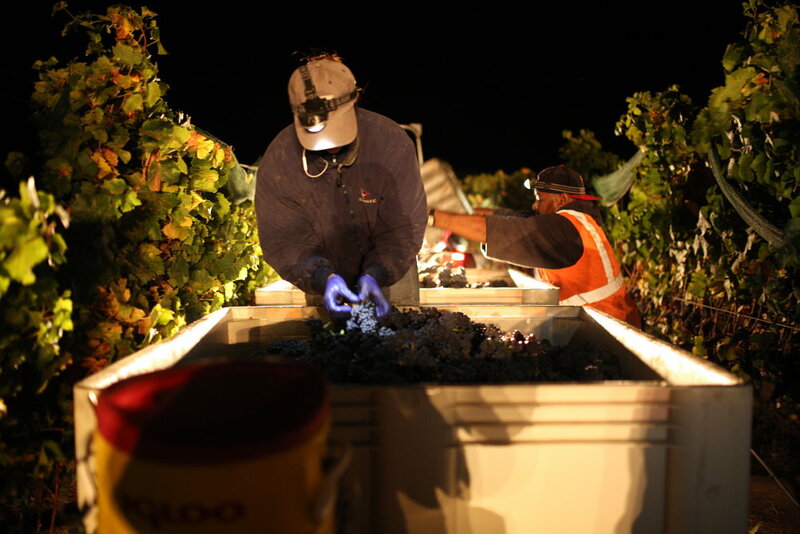 Charles does the final check at the staging area helps load the grapes on the trucks and takes them to the winery. In 2017, in addition to Land of Promise, the harvest was for 15 other wineries over 16 nights during a 32 day span. We could not do this without a great team behind us, from the winemakers to our workers. We are very blessed to have a great crew and we can not thank them enough. "Since day one at Terra de Promissio, we have employed sustainable farming practices that consider the entire ecosystem-vines, insects, other plant species, soil life, soil type, and our surrounding ecosystems-in order to minimize pests and diseases and create a healthy symbiotic relationship between our vines and the land." Since our inaugural vintage in 2005, Terra de Promissio has consistently received very high accolades for its fruit. Whether a winery is vineyard designating or blending our grapes into a Sonoma Coast wine, multiple critics from the leading wine publications agree that the wines that include Terra de Promissio grapes are some of the best in the world. Below are some of the highlights from the first 13 vintages. In 2011, the Wine Spectator named the 2009 Kosta Browne Sonoma Coast Pinot Noir as its Wine of the Year. The wine comprises fruit from three vineyards including Terra de Promissio. It is the first Sonoma County wine to win the award since 1999 and the first ever Pinot Noir wine to win. Wine Spectator editors tasted and reviewed over 16,000 new releases from 12 countries and they noted the Kosta Browne Sonoma Coast bottling showcases Michael Browne’s meticulous winemaking and the quality of their grape sources. 2011 Wine Spectator Top 100: Rank: 1 "Wine of the Year"
Ripe and deeply flavored, concentrated and well-structured, this full-bodied red offers a complex mix of black cherry, wild berry and raspberry fruit that's pure and persistent, ending with a pebbly note and firm tannins. Drink now through 2018. 5,818 cases made.